This coming weekend is the 40th anniversary of Woodstock - the 3-day music festival attended by nearly half a million hippies. Woodstock was not only regarded by many as the greatest moment on popular music history but it also closed a decade of rising anti-war sentiments. The peace symbol was actually created just over 10 years before Woodstock as the symbol for the then new nuclear disarmament movement. It is not a dove track but a combination of two semaphore initials, N and D for nuclear disarmament. The work of artist Gerald Holtom, the logo was purposely never copyrighted. 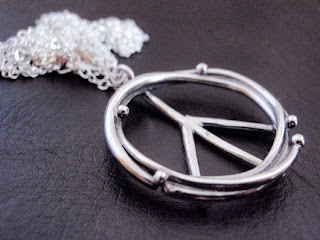 The peace symbol is now the universal emblem of peace and naturally the inspiration for many jewelry artisans. One of the most outstanding designs I've spotted on Etsy is Atlanta based metalsmith Delias Thompson's Organic Peace Sign in sterling silver shown above. An enterprising company, Peacefence makes handmade peace pendants from the original Woodstock chain link fence. Their website shows how they straighten the chain link wire, bend and weld the jewelry. The pendants are polished and a protective coating applied. That chain link fence actually failed to keep anybody out because parts of it fell down and there were incomplete gaps where turnstiles were supposed to be. Thousands had already come days early for Woodstock and it became impossible to collect any admission fees. The traffic jam was so immense, many gave up and walked instead. Everything was in short supply - food, water and functional portable toilets. It rained turning the field into a quagmire. Somebody laced the water supply with LSD at one point. But they got to hear music for three whole days. Woodstock defined a whole generation for sure. Peace, man. What a great post Pearl...I didn't know know how the peace sign was "born'...I loved the hippy era!!! listen mgmt reminds me woodstock..
Great post! You gotta love the peace symbol no matter who you are. I mean, how many symbols out there changed the world in so many ways? It speaks to just about every race and community on earth!